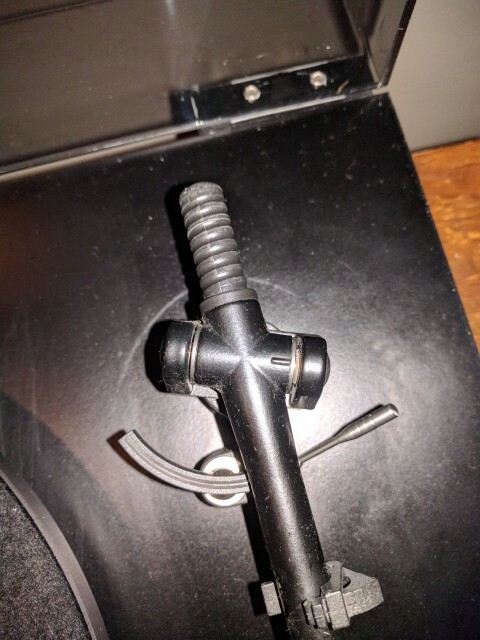 A bit of a shot in the dark, but trying this question here: I'm trying to set up the tonearm on a Rega Planar 2 (the 70's model with a green logo), and when fiddling with the counterweight I threaded it all the way off the back of the tonearm. Problem is, it won't thread back onto the plastic screw again, it just slides right through. 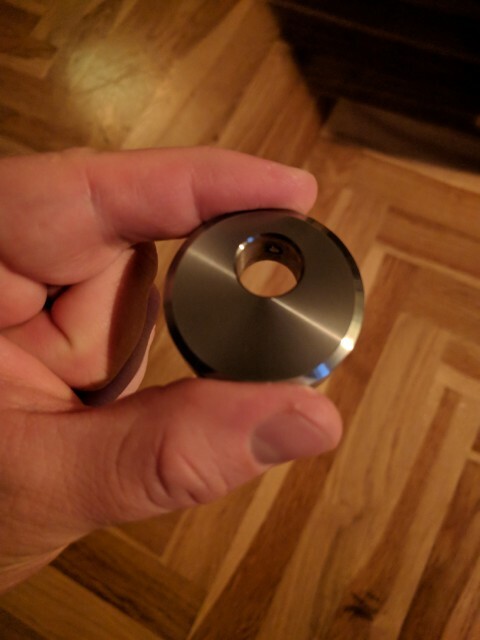 The counterweight has a little sprint that I suppose should thread into the screw, but it's pushed all the way up into the counterweight and won't move when pressed. Should I try to hammer it down with proper force, or am I just missing something silly? Hard to understand exactly what you're asking, but here's a picture of what it should look like. The bits on this are red cos it's a Nad one... your bits will be green... otherwise should be the same. I think the little plastic nib must have popped out of yours? It's not common for that to happen tbh. The bodge would be to use some scales to set VTF and hold it in place with a bit of blu-tak. Or a slither of insulation tape on the inside diameter? ...and here's the counter weight. Notice how the tiny rod (inside the inner circle) lies just against the inner wall, making it impossible to thread onto the tone arm. Looks like an aftermarket counterweight to me. As it's underslung perhaps it's not meant to thread on? Often these come with a new (non-threaded) stub. You use scales to set VTF and lock in place with a screw. Not sure what you've got there. That is an aftermarket counter weight, Incognito I suspect. They did not thread on but had a small 1.5 or 2mm hex screw for tightening IIRC. There was a replacement stub arm for that type of counter weight sold without the thread. So it won't thread on. Needs to be pushed on and then locked when in the right position ie balanced. Google michel technoweight. It’s the same principle as their design. Should be set at about 1.75g if memory serves. I see. Frustrating that I must either have fumbled the hex screw away at some point (the counterweight did thread on just fine before I removed it completely after all) or never got it in the first place. I'll just try to get a new one at the hardware store and start again. I had a look at the michel technoweight as well, but can't justify the price right now. Thanks for all the advice! It’s not a device that if respected is going to need regular adjustment or will move out of your settings. I’d just slip it over without the protrusion and use blu tac or tape to hold it. Yep. Or look out for a secondhand original counterweight. For an upgrade one to do any good it needs the stub too.